The team behind CoinPot (CP), the top-rated free bitcoin microwallet, have added a new feature for budding crypto millionaires which will make the service even more appealing. Not content with already offering excellent referral commissions, CP has added a feature which tells you every time one of your referrals makes a claim in real time. Each time a claim is made a small green box now appears in the top righthand corner of the CoinPot panel telling you the source and the amount you’ve been paid in commission. If you’ve got a large circle of referrals watching this pop-up appear every few seconds is quite a satisfying experience, especially as you’re earning bitcoins for doing nothing! Bitcoin faucets pay visitors tiny amounts of cryptocurrency in return for completing a captcha. The site owners do this because they carry advertising on the page and want as many views and clicks as possible to maximise their earnings. The more traffic they generate the more likelihood there is that they will earn more money then they pay out to attract visitors. There’s no catch to these sites, although you’d be wise to scrutinise some of the adverts that appear on them before parting with any cash. The only real downside is that the amount they pay out per visit is tiny and in cryptocurrency circles are often referred to as ‘dust’. Enter CoinPot. This free service allows you to collect these tiny amounts of coin together to create one larger pot of cryptocurrency. There are other microwallets out there, but for the purpose of this article we’re focusing on CP. If you click on the links above you’ll see that the sign-up process is very simple and you’ll be earning free bitcoins in no time at all. If you’re unsure how to get started then carry on reading. All of the above faucets are reliable, offer excellent pay out rates and are completely free and legitimate. Every time you make a claim the coins go into your CP wallet where you also own an exchangeable CP bonus token for every claim you or your referrals make. 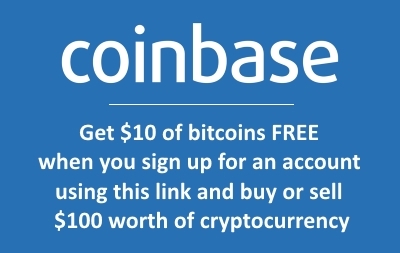 To get started with faucets, all you need to do is set up a free bitcoin address with a service just as Coinbase. We recommend this company because a) We use it; b) It’s one of the largest and best-known services around; c) If you set up an account and buy or sell more than $100 worth of cryptocurrency, we get $10 worth of bitcoin and so do you! But there’s no obligation to buy any coins, you can simply set up an account for free to get a wallet address. Bear in mind that there are many other places you can get a wallet address for free, so do some research online before choosing what suits you. Just make sure you choose a legitimate site as there are hordes of scammers out there just waiting to steal your coins! Once you’ve got your wallet set up you need to link it to your CP account. After you’ve done this simply sign up to each of the free CP faucets and away you go! Once you’ve gathered enough coins you can withdraw them to your bitcoin wallet where you can either spend them or start trading your cryptocurrency to make it grow. You can earn extra coins by sharing the referral links offered by each CP faucet with your friends and anyone else and each time they claim you earn a commission making this a terrific way of developing a passive income stream. And this is where the new, and we would say addictive, CP feature comes in to its own – you can now watch your coins roll in live without lifting a finger. We’ve written extensively about CP in the past and it is consistently our top-rate microwallet service. We wish more faucets were connected to CP to give users more ways to earn, but equally we understand why CP wants to stick to its carefully curated stable of quality faucets. For now we’re just happy that the best microwallet out there just got better! If you’ve got any questions about how to use CoinPot or free bitcoin faucets then feel free to drop us an email.